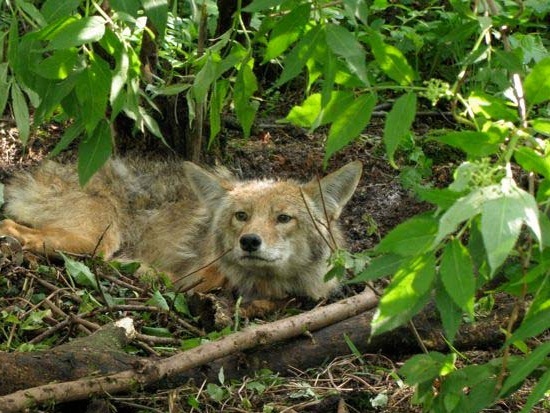 Edmonton Park Rangers often face this question: why are coyotes in my neighbourhood? There are a number of reasons coyotes like Parkallen, and some of them we can control. Coyotes are seen in virtually every neighbourhood at some time throughout the year; they will return and stick around where food, habitat and security are easy to find. Unlike their wild cousins, urban coyotes have urban food sources including bird feeders, pet food left outdoors, unsecured garbage and fallen fruit. Small spaces under patios or concrete steps, behind shrubs and under low hanging trees create dens and secure shelter. Our planned neighbourhoods offer easy mobility allowing coyotes to move freely from front to back yards and along the alleys. Coyote pups are born in the early spring; they will stay in family groupings for the summer and are left to fend for themselves in late fall. The summer is when the pups are taught to hunt, find shelter and survive. Summer is the ideal time for humans to minimize opportunities for coyotes in their communities, and discourage pups from getting to cozy in human spaces. How can we discourage coyotes? Pick up fallen fruit from trees and bushes - coyotes like fruit! Coyotes are smart animals - they will learn where they are and are not welcome.